I know I've mentioned this before, but it is true. Computer animated 3D kids films are rather common in this day and age, to the point where they've become a classic joke amongst critics and even regular moviegoers. There's nothing bad about these films; most of the time they're enjoyable. But it's the lack of depth to the story and characters, which is pushed aside in favour of technical wizardry and 3D visuals, that makes them so generic. Rio falls into this category. It's good, but doesn't stand out in any way apart from it's visuals. And that's a real shame. 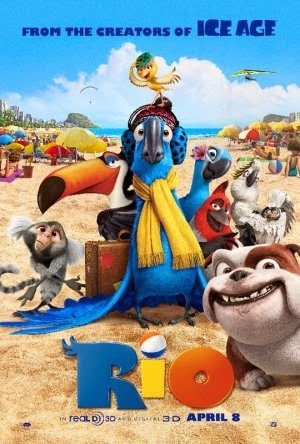 The film tells the story of Blu (voiced by Jesse Eisenberg), a domesticated Spix's Macaw who discovers he is the last male of his kind, and travels to Rio de Janeiro in Brazil to win over the last female, Jewel (voiced by Anne Hathway) and save his species. That's the bulk of the story, at least, there's many troubles the two have to overcome including dastardly bird catchers and thieving marmosets, not to mention Blu's journey to get back to his owner when they are split apart in Brazil. The first thing that comes to mind regarding a film like this is the quality of the animation and, obviously, the 3D effect. The animation looks absolutely fantastic. The landscapes and characters are oozing with charm and colour, and everything has a wonderfully soft feel to it. The 3D effect is the same generic stuff you see in other 3D films: it's unnecessary and barely used, and when it is, it's incredibly gimmicky. It's nice to have a sense of depth, but in the end those annoying glasses just detract from the films colour and the effect is underwhelming. The film's story is nothing truly special, and although it works just fine, it's rather predictable and features too many characters, many of which have hardly any screen time and, although funny, are very forgettable. The opposite applies to the film's musical numbers; there's hardly any of them, and even at moments where you'd expect one, there's nothing. They're also pretty forgettable, and not on par with Disney's efforts. The orchestrated compositions in the soundtrack are incredibly lively and give the film a jubilant atmosphere, but to call it a musical is a bit of a stretch. The voice cast is excellent, featuring the talents of Jesse Eisenberg, Anne Hathway, George Lopez, Tracy Morgan, Jemaine Clement, will.i.am and Jamie Foxx. All the cast members perform brilliantly, bringing a lot of humour and charm to their characters. I'd say my personal favourite was Jemaine Clement as Nigel, the villain, who delivers a sophisticated yet extremely nasty tone of voice, establishing an intimidating personality for the character. I really have nothing else to say regarding this movie. Despite it's shortcomings, I still did enjoy it. It's nothing unique and doesn't stand out in any particular way, but kids will love it and it's still got enough humour and charm to please adults as well. It looks great too, but see it in 2D, the 3D is once again a bit of a waste. Don't expect an incredibly jazzy musical either; whilst it has the traits of one, it's let down by forgettable songs. But overall, it's an enjoyable animated flick. Nothing more, nothing less.